us to offer competitive pricing, superior quality and services. to meet customer enquiry economically. natural and polished pebble available and potteries. Since the establishment we have exported in excess of 8000 containers. 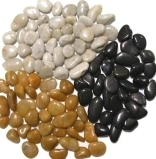 -Polished and Natural pebble stone. We also offer customised designs of our products to meet your needs. North America,Australia,Middle East, Italy, Japan and Canada.